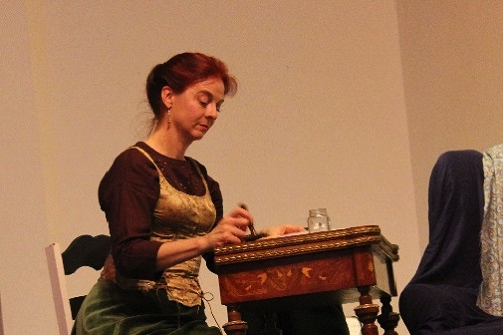 Ivanna Cullinan as Lady Thomasine in Patronage. Photo by Mike Gregorek. BOTTOM LINE: A fairy tale about the power of words should perhaps choose its words a little more carefully. Patronage is a short play about a young suitor desperate to win the affection of a beautiful countess. Unfortunately for the stuttering, stumbling noble, the woman he loves cares only for affections communicated through the written word, and he can barely muster the wherewithal to summon a simple simile. His love for the countess runs deep, and so he visits an old poet, who he commissions to write a poem worthy to woo the object of his affections. Over the course of an hour and change, we watch these three players literally and figuratively dance around the space as they tell a tale of love, scandal, and hope. The story is a simple one, told without much pomp and circumstance and relying heavily on the strengths of the actors to compensate for the unique challenges that the Rabbit Hole Studio presents to those who would seek to use it as a theatrical venue. Upon first entering the space, I immediately noticed that the audience members who had already arrived were seated on couches and floor-pillows in the middle corner of the L-shaped room. I began mentally preparing myself to crane my head towards the action for the next hour, and was surprised and impressed when both ends of the space were activated over the course of the play, activating even the large pillar in the center that many theatre-makers might have seen as an obstacle, rather than the opportunity that the set designer, Cale Jordan, made of it. On the left side is the Countess’ chamber, where the suitor makes his many attempts to win the woman’s heart, and on the right is the study of Lady Thomasine, the poet of mysterious infamy and a mother of five who he hires to write for him. Thomasine is portrayed by Ivanna Cullinan, an experienced actress who brings great depth and skill to the role. Cullinan unlocks the wealth of compassion and knowledge that sits at Thomasine’s fingertips, underscored always by the secret tragedies which we only get glimpses of in the play. As the most detailed character in the play and the chief narrator of the prosaic interludes, Cullinan’s Thomasine lights a consistent fire under the entire performance. The action of the play is punctuated by short sections of narration from the three actors, giving insight into the events that led to the circumstances we see develop on stage. These interludes, though ripe with exposition, often lack the same level of investment and care from the actors that the rest of the play does. It is unclear for much of the play whether or not they are even part of the same story. References are made to characters in the play, but with the general gloss of information given to so many of the agents of the story (The King, The Countess, The Poet, etc) it became somewhat confusing to figure out who they were talking about. This was not helped by the fact that, towards the end of the hour, the characters themselves no longer seemed to be excited to be telling the story, as their once dedicated introductory dances faded into begrudging ceremony. When their need to tell the story lapsed, I couldn’t help but let my own need to hear it dissipate as well. Patronage is an interesting exploration of the power we give words, and the lengths people will go to for the people they love. I hope the creative team continues to experiment and refine how they present this exploration to their audience. Patronage is written by Kati Frazier and directed by Corinne Woods. It is produced by Random Access Theatre Company. Prop design is by Dana Robbins. Set design is by Cale Jordan. Lighting design is by Tony Lepore. Sound Design is by Chris Chapell. Costume design is by Anna Grace Carter. The cast is Ivanna Cullinan, Calaine Schafer, and Jamie Boswell.